Church. 1880-82. By J B Cory. Slate rubble with sandstone ashlar dressings and slate roof. Nave and chancel with south vestry. Coped gables; lancet windows. 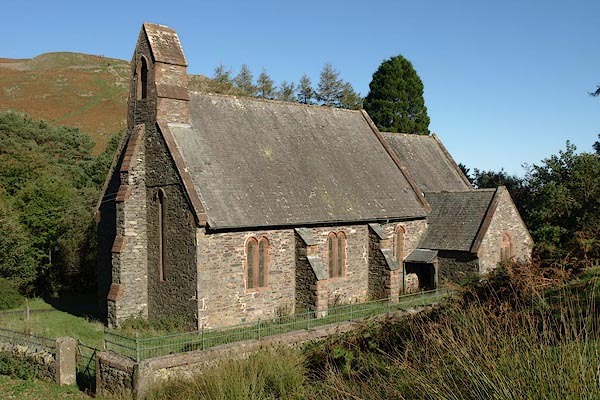 3-bay nave has later deep weathered buttresses; south side has paired lancets, but eastern bay has single lancet; north side corresponds, with gabled porch to west, entrance of one order and inner chamfered arch, quatrefoil above has latters: "AoX" and date: 1897. West end has lancets flanking buttresses and gabled bell cote with louvred trefoil-headed opening. 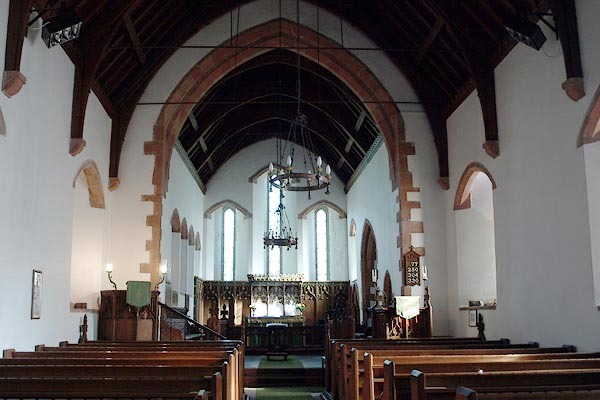 Chancel has gabled vestry with 2-light window and rounded under relieving arch; lean-to canopy over west entrance. 3 stepped lancets and basement entrance to east; lancet to south; lancet and triple lancets to north. Interior: roofs have deep-arch-brced collars; windows have segmental-pointed relieving arches. Plain round font has dog-tooth moulding; 3 coronae. Double-chamfered chancel arch dies into jambs. Traceried pulpit, reading desk, stalls, altar rail, east panelling with reredos under projecting cornice with creating. Recess to south has C17 style cupboard presented 1954. Chancel east window and lancet to north have late C19 decorative glass; other windows display notable collection of stained glass by Jane Gray, 1970s. Most (all?) the stained glass is by Jane Gray, 1970s. Commemorating Elizabeth II; accession 1952 and jubilee 1977. St Cecilia is the patron saint of music.